Description This selection of Gala is being offered under license agreement with Willow Drive Nursery, Ephrata, WA. The fruit of Brookfield® Gala is considered one of the best in the industry for the prominent stripe. Originating in New Zealand, this Gala sport is widely planted in the United States and consistently produces fruit of excellent color and overall fruit quality. Photo courtesy of Willow Drive Nursery. 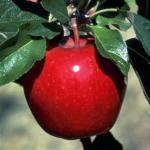 Pollination Information Brookfield® Gala blooms in mid-season and will pollinate all other early blooming apple varieties, varieties blooming in the middle of the season, and also varieties blooming late in the season.